A High Court judge has ruled that the way the taxi-hiring app firm Uber calculates fares based on a "meter-like" system is not illegal. The case was brought by Transport for London (TfL) and Uber, seeking clarification of the law governing private hire vehicles in London. Mr Justice Ouseley heard arguments from both parties, as well as from the Licensed Taxi Drivers' Association. Uber said it was a "victory for common sense". The California-based company operates in 60 countries worldwide and opened in London in 2014. The Licensed Taxi Drivers' Association said it would seek to appeal against the decision. What is the legal dispute about? Taxi meters. Only black cabs are permitted to have meters because these are regulated and checked by Transport for London which sets universal fares. It is illegal for private hire vehicles in the capital to use meters to calculate fares essentially because they cannot be checked. Why might Uber's practices have breached this rule? Customers download an app that uses GPS technology to locate available drivers nearby and puts them in touch. Uber drivers use this same GPS tracking technology on their smart phones, linked to external computer servers, to calculate customer fares. Other factors such as car type, the customer's location, and local demand - price surging, also influence the final amount charged. 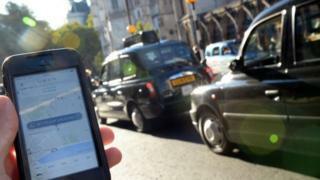 High Court judge Mr Justice Ouseley said the GPS and server system did not constitute a taxi-meter. Why does the ruling matter? Arguably it is purely an academic argument. Uber says the ruling will not affect its ability to operate in the capital. However Transport for London's plans to update the private hire regulations may yet render the ruling irrelevant, as one of TfL's proposals is to require all private hire vehicle operators to state their fare before accepting a booking. Are the parties likely to accept the ruling? No. The Licensed Taxi Drivers' Association (LTDA) said it would seek to appeal against the decision in the Supreme Court - the highest court in the land and the final court of appeal. Uber said: "This is great news for Londoners and a victory for common sense. This ruling was not a marginal call. It was quite emphatic and indeed contemptuous of the fact the case had been brought before the High Court. If the LTDA chooses to appeal it, we will respond." Who is paying for this legal case? TfL paid to bring the case before the High Court. It has not disclosed how much it has spent in legal fees to date, and all three parties have independently engaged lawyers to represent them.